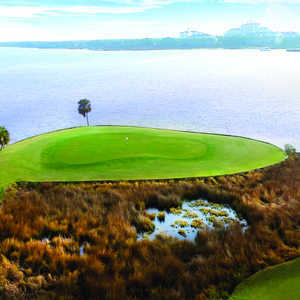 DESTIN, Fla. -- To get a feel for the Links Course at Sandestin Golf and Beach Resort, just play the ninth hole. 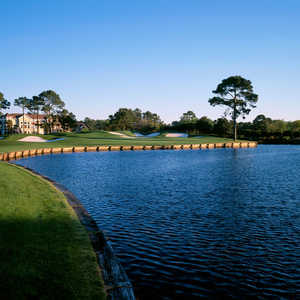 There's water on the majority of holes on the Links Course at Sandestin. After carving the masterpiece called The Links Course, Tom Jackson returned to Sandestin to develop the course we call Baytowne. As Jackson himself says, "Each hole has a personality all its own." And that's what makes this course so special. Set up along Choctawhatchee Bay, golfers must carry a marsh off the tee, another one on the layup and cross an inlet on the way to the green. Three shots, three carries over water -- and along the way are some of the best views on the Emerald Coast of Florida. Just minutes from the Gulf of Mexico, Tom Jackson designed this 6,700-yard course to play with the prevailing sea winds. There's water on 14 holes, plenty of bunkers throughout, palm and pine trees and a few risk-reward holes that reward you if you have a little patience. 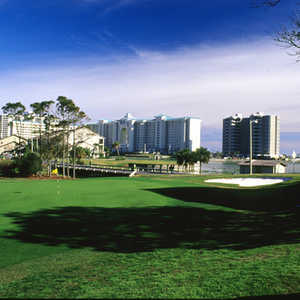 The first few holes on Sandestin's Links Course serve as a warm-up for the rest of the course. By the sixth hole, things really start to get interesting. The 414-yard sixth is the course's No. 1 handicap hole. From the back tees, the tee shot is over a lake and around or over two tall trees onto a fairway that sets up an approach shot over water. And for the next couple of hours, those types of shots are common. One of the best views starts on the eighth hole. From the tee of this short par 4, there's a large lake to carry from the tips. Behind the green is the bay. Late in the day, with a sunset, the views don't get any better. Unless you consider the par-5 13th and par-4 14th, that is. With marsh grass and yachts in the background on the bay, these holes are pretty special, too. The 13th is just 504 yards from the tips, but it's still the course's No. 2 handicap hole. With the bay on the right and another hazard pinching in on the left, driver may not be advisable from the tee. Then, for good measure, the elongated green is tucked into the marshes, creating a semi-island effect. The following hole also features an approach over the marshes with the bay on the right. Although it's rated as the No. 6 handicap hole, the 425-yard 18th is arguably the toughest. The fairway runs out of real estate around 230 yards, setting up a long approach with water left, front and right of the green. A little course management goes a long way on the Links Course at Sandestin Golf and Beach Resort. With all the water and bunkers on the course, you have to think your way around it. There are plenty of holes where driver isn't the best option and others, where the approach shot might dictate a more conservative approach to avoid the big numbers.